Nothing beats the morbid delight begot from a good old-fashioned bad dream. It’s the stuff memorable horror movies are made of. There’s no denying, being tantalised and terrified go hand in hand. But what about those bad dreams that leave you thrashing in a bed of sweat-soaked sheets and screaming for salvation? 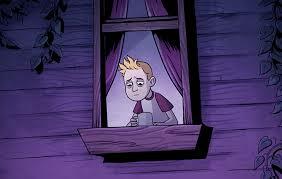 Nightmares can plague a kid’s sleep and wreck their waking world. Fortunately, there is a thrilling new series available to primary aged kids to help keep the bedtime be asts at bay. Nightmares!, by writing partners, Jason Segel and Kirsten Miller is the substantial first book in a new series, which dares you to go to sleep. Good luck with that. There’s way too much skittish action, adventure and horror to bore even the most critical mid-grade reader. 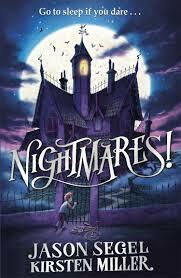 Eleven-year-old Charlie Laird is in the middle of his own real-life nightmare. 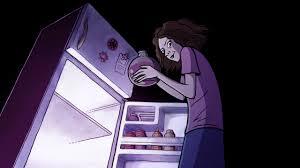 Still dealing with the loss of his mother three years ago, he now also has to contend with living in a purple house that he is not keen on with a step mum he believes is a witch and a father he feels has forgotten him. Feeling alone and vulnerable, Charlie goes to extreme measures every night to stay awake. He is terrified of falling into slumber because each time he does, he enters the Netherworld, a place where his most terrifying nightmares torture him with sadistic regularity. Living in const ant fear jeopardises Charlie’s schoolwork, blurs his logic, and transforms him into a person that scares even him. Then one afternoon, an opportunity to discover more about his dubious step monster leads to a nail-biting adventure in the Netherworld, one Charlie is not sure he’ll ever be able to emerge from. Nightmares is thrilling on every level. I was curious to see how well comedic actor and star of films like Despicable Me, Gulliver’s Travels, and The Muppets Movie could write. I was far from disappointed. Segel executes his penmanship (along with Kirsten Miller) with exquisite strength and accuracy, slicing through the mundane to reveal a voice of tremendous depth and humour and expose worlds that readers are instantly familiar, if not one hundred per cent comfortable with. Their characters, including those who frequent the Netherworld, possess a mixture of Chucky-style surreal horror and emphatic warmth, which keeps readers engaged whilst never quite certain of who to trust. It’s spellbinding stuff. Nightmares propels us into those creepy, fearful places we are always relieved to wake from but simultaneously suggests to young readers that in order to truly surrender your fears and leave them behind once and for all, we must face them. If we can be as brave as Charlie can, we may just be able to learn that nightmares are really just the stuff of dreams. I love the slightly psychotic sense of satire, the horror, and the comedic parody in Nightmares. The notion that ‘what can’t kill us and what we fear can make us stronger’ is just one of the many reasons to read this story. I can’t wait for the next nightmare to begin – due out in August 2015! Meanwhile give yourself a delicious fright with Nightmares, available here.